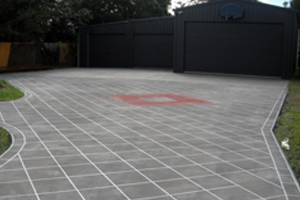 Our domestic concrete services offer a wide range of products. No job is too big or small and we do each job with the same amount of professionalism and dedication. We have listed some of our domestic concrete services below. 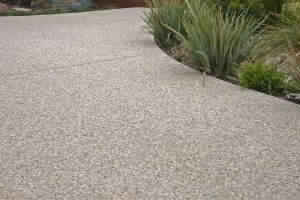 Exposed Aggregate Concrete is a very popular and fashionable decorative finish, it is used at most display homes. The finish is not smooth, rather the aggregate (stone/pebbles) are exposed which makes it rough and gravelly. However the aggregate is quite fine making it comfortable to walk on with bare feet. Exposed Aggregate Concrete is a standard grey or off white cement mixture with a select type of customised small aggregate (stones/pebbles) and will sometimes have a colour oxide mixed through (mixed through at concrete plant). It is finished with a high pressure blast exposing the aggregate materials (stones/pebbles) on the surface. All concrete paving must be treated with construction joins/cuts to minimise cracking. Spacing of these joins/cuts will be site and design specific. 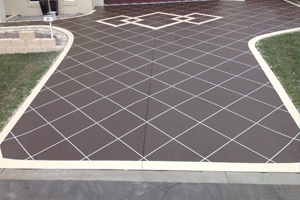 Sealing of any paved area is highly recommended to minimise fading, staining and cracking. You will be familiar with this finish from regular footpaths and kerbs. 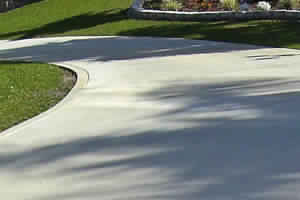 Plain Concrete is a standard grey cement mixture. It is finished with a “Stipple” creating a slightly textured finish with no aggregate (stones) showing on the surface – A smooth or polished concrete finish is not suitable for paving outdoors as it would create a slippery hazardous surface. This type of concrete is the cheapest option offered by Hume & Sons Concreting. CONTACT US TODAY FOR A QUOTE ON A DOMESTIC CONCRETE PRODUCT!